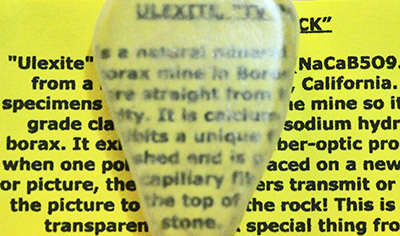 "Ulexite is also known as TV rock due to its unusual optical characteristics. 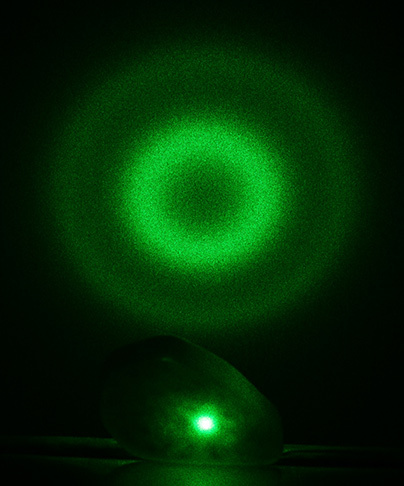 The fibers of ulexite act as optical fibers, transmitting light along their lengths by internal reflection. 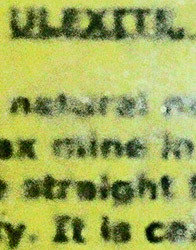 When a piece of ulexite is cut with flat polished faces perpendicular to the orientation of the fibers, a good-quality specimen will display an image of whatever surface is adjacent to its other side"
The brightness and diameters of the rings varies depending on the section of the specimen transmitting the beam. Tilting the specimen causes the rings to stretch out coma-fashion. Regardless of the precise orientation there is always a central dot or ring and a single, dimmer outer ring. Update: I found the explanation for this behavior here. I obtained my specimen on eBay from whereonearth. I can highly recommend them. They have some really bizarre stuff for sale at their web site.